Whiff of Joy's Mouse under partyhat is my central image. I love this stamp, because it is super fast to colour and absolutely fun for every card :) I stamped and coloured the partyhat two times, cut around one and adhered it with stapming dimmensionals over the original one. I used my new Spellbinders Labels 4 again. A Martha Steward border punch and a SU RubOn for the sentiment. I received my Copic Airbrushing System the other day and on this card you see my first attempt with it. Super easy to use and gives a wonderful effect. Whiff of Joy's Maus unter einem Partyhut ist das zentrale Motiv meiner Karte. Ich liebe diesen Stempel, da er super schnell zu Colorieren ist und jeder Karte einen lustigen Touch gibt :) Den Hut habe ich ein zweites Mal gestempelt und coloriert, dann ausgeschnitten und mit Abstandshaltern über den originalen geklebt. Ausserdem habe ich meine Labels 4 von Spellbinders wieder verwendet. Vor ein paar Tagen habe ich das Copic Airbrushing System erhalten und es bei dem Hintergrund der Maus gleich ausprobiert. Super einfach zu verwenden und gibt einen tollen Effekt. Paper: SU cardstock pumkin pie & bashful blue, Basic Grey, Su dp "Washington Apple"
wunderschön, die Farben sind wirklich toll, so fröhlich. Ganz ganz toll geworden. Wunderschön und die Farben sind sooo toll. So gorgeous card! I just love that mouse! So cute! This is so adorable!! 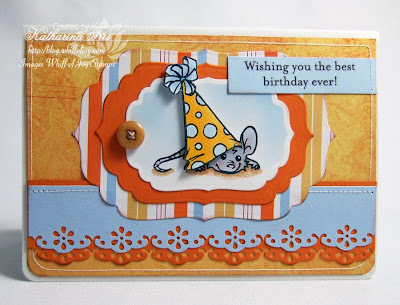 I love the colors and that mouse is one of my favorites! OMG,die Farben sind ja wohl der Hammer. Auch wenn der Tag grau ist,dann braucht man bloß dein Kärtchen anschauen und schon ist Frühling! Wowwww, der Airbrusheffekt sieht spitzenmäßig aus!!!! wowww Katharina,what a beautiful card,l love the stamp and colours. I love the fun, bright colors! This image goes so well! This is charming and adorable. Love it.